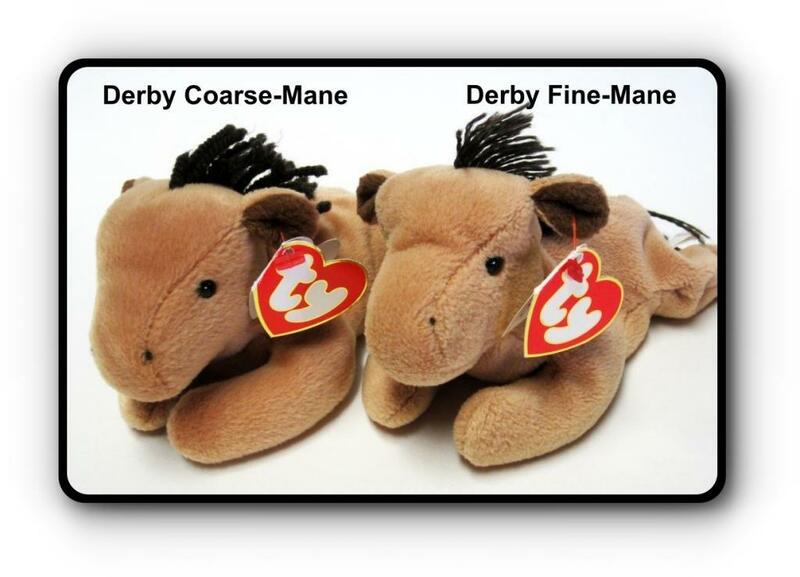 Ty Beanie Baby Derby Fine Mane vs Coarse Mane. 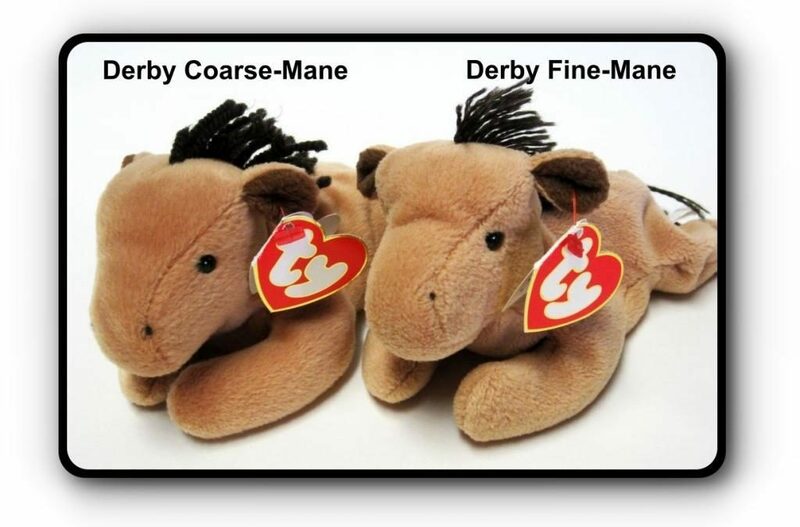 Becky Estenssoro shows how to tell the differences between a rare Fine-Mane Derby vs a Coarse-Mane Derby. The Derby’s were introduced in 1995. In the early years of the Beanie craze, Collectors distinguished the difference between these two Derby’s by their mane and tail – the size, color and number of the yarn strands.Thus the name Derby Fine-Mane and Derby Coarse-Mane were derived. As Collectors soon found out, there were significantly less of the Fine-Mane Derby’s produced, which made this rare Derby’s price soar and heavily sought after. Still to this day the Fine-Mane Derby demands a high price. 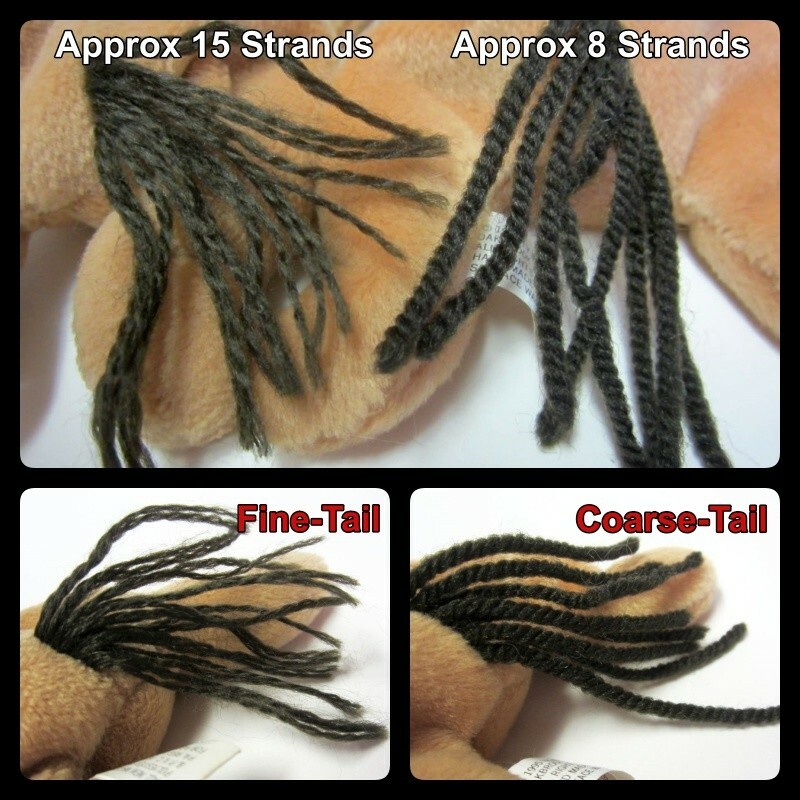 There is a big difference in the size of the yarn, where Fine-Mane Derby’s yarn in thinner, has more strands of yarn on his mane, and goes down his back further than the Coarse-Mane Derby’s mane, whose yarn is thicker, has less strands of yarn and a shorter mane on his back. Fine-Mane Derby’s tail came with thinner strands of yarn (approx 15 strands) vs the larger strands of yarn (approx 8 strands) on the Coarse-Mane Derby. Also the color of yarn on Fine-Mane Derby’s tail is a slightly lighter color brown than the Coarse-Mane Derby’s tail. Fine-Mane Derby ONLY came with a 3rd gen swing tag, style #4008. The ONLY tush tag that came on Fine-Mane Derby is a 1st generation black & white tush tag. These Fine-Mane Derby tushes ONLY came with a 1995 copyright date and “HANDMADE IN CHINA”.